During the month of November, Independence High School students will be focused on post secondary careers and education. Our goal is not only to help them earn a high school diploma, but also to help students find their passion in the form of a career. We believe that post secondary education and introducing students to several types of career opportunities will help students navigate their individual career path. On Monday (11/6) and Friday(11/10), counselors will help all seniors learn how to get money for college by completing the FAFSA. We will join Timpview on Tuesday the 14th at 5:00 for a FAFSA completion night. We will help each Senior apply to college. 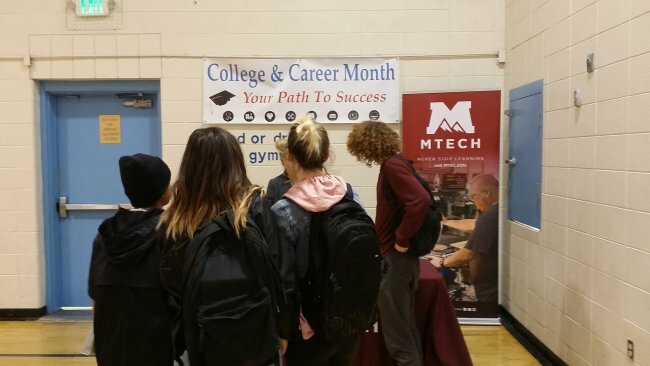 Mtech, Clyde Companies will come the answer questions about the programs and careers they offer. We will be attending UVU’s open house Thursday 9th. We also have all the Seniors photos hanging in our main hall. It is a fun tradition to see all the Seniors who will be graduating wearing a cap and gown. Different college pendents will be hung on their Senior picture if they make a decision on where they want to go once school is out in May. We love our Seniors and we are so proud of their accomplishments.